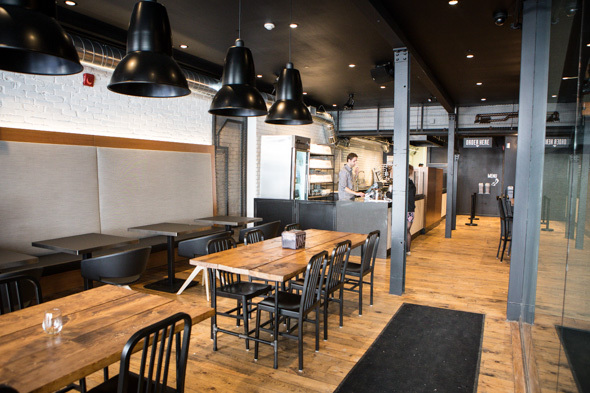 One Pizza is a pizzeria built on a simple - and ingenious - concept. 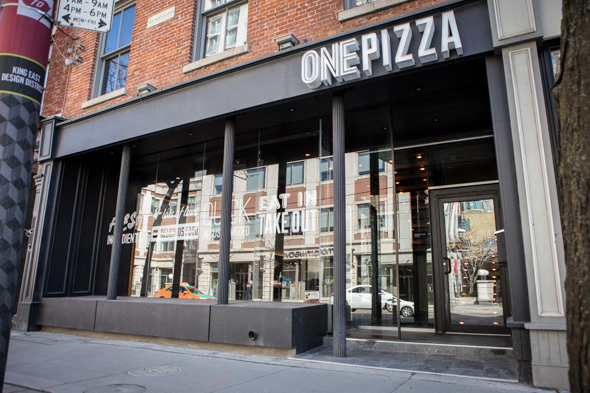 Though the menu at the King East spot spans several signature pizzas and dozens of toppings, there is only one size (an oblong personal-size pie that will more than tide you over until dinnertime) - and only one price ($11.86 per pie). Co-owners and new restaurateurs Andrew Hay and Tim Gordon took over the former home of Kultura (which spent two short months as Ole Ole) earlier this month. 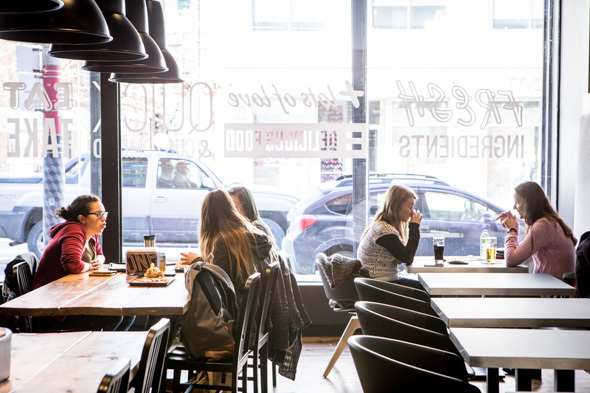 For their first effort, the duo decided they wanted to create a fast-casual eatery that would appeal to the neighbourhood's varied mix of office workers, students and locals. 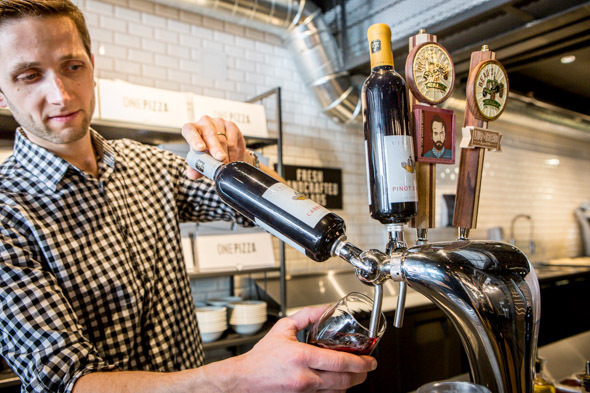 "We realized the fast-casual world of food has evolved in every category, but up until now it's kind of excluded pizza - which is amazing, because pizza's everyone's favourite food, let's face it," Hay says. 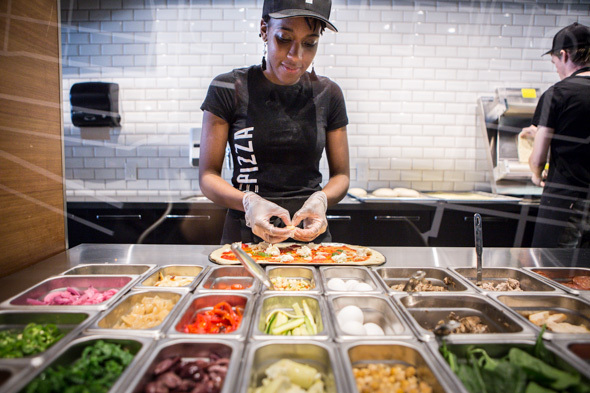 Their solution was to to offer quick-cooking pizzas, with the per-topping nickel-and-diming of your typical pizzeria removed: "So often, you go into a pizza restaurant, and it's a dollar for this and a dollar for that." 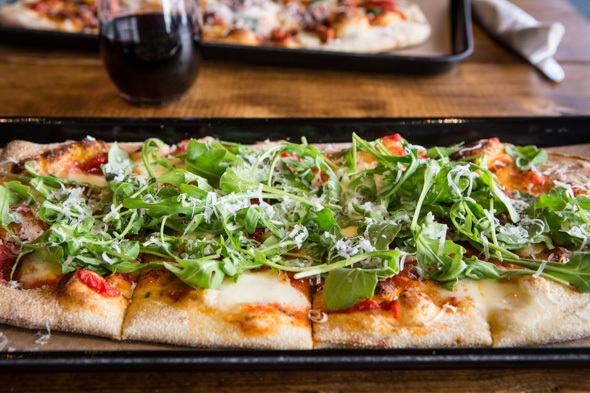 If you'd still like a few suggestions, they've got you covered with eight signature pizzas. 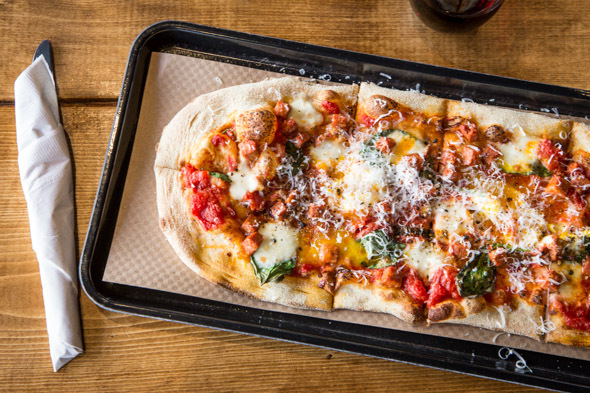 The signature is the (totally inspired) Hunt & Peck, which features chorizo, spinach, and a couple of fresh-cracked farm eggs. Spicy tomato sauce and housemade chili oil add extra heat, and the whole thing comes finished with a healthy grating of Parmesan cheese. The eggs and Parm lend tons of rich flavour - but the whole thing goes down easy thanks to the thin, light, chewy crust, which comes dusted with semolina for a little extra texture. Fans of the more classic toppings can opt for the Aristocrat, their spin on a margherita. The fresh mozzarella and chunky tomato sauce are there, but they take things up a notch with a drizzle of pesto, a few torn-up cloves of caramelized garlic, a handful of arugula, olive oil, and more of that fresh-grated parmesan. 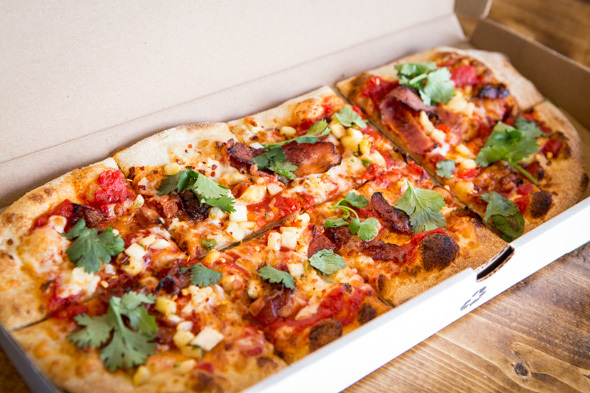 Other favourites include the Aloha Smoke, a Hawaiian-inspired pie that substitutes pineapple salsa for the canned stuff, and Date Night, which pairs dates with fennel sausage, caramelized onions and BBQ sauce. Clearly, they're not traditionalists here. 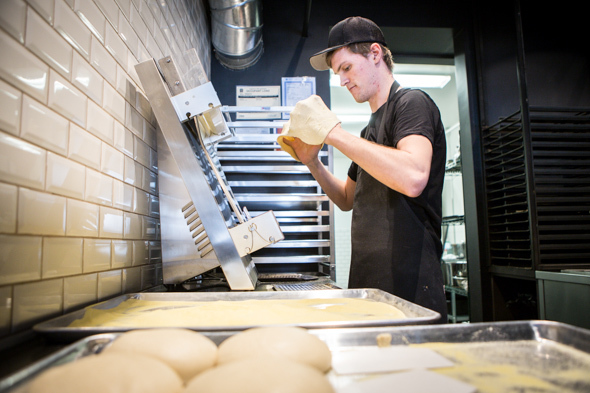 "The misconception is, to get good pizza, it should be that traditional Italian-style pizza," Gordon explains. "We don't think that's true. We think it's all relative, and we wanted to create something that was more 'Toronto'. It doesn't fall into any category." 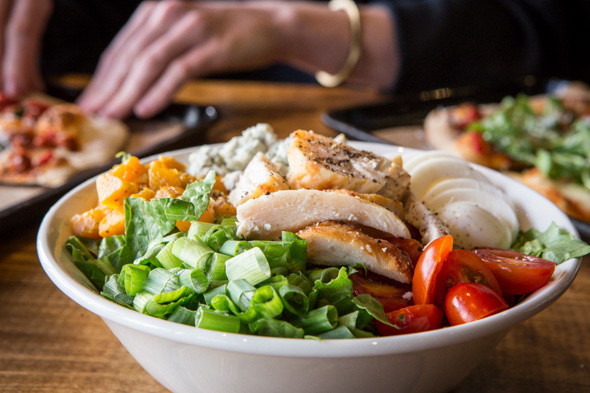 If you're not in the mood for pizza, they also offer two meal-sized salads, including their house chopped salad ($10.45), a hearty mix of grilled chicken, sweet roasted squash, blue cheese and hard-boiled egg on a bed of romaine. It's a decent light option - the caramelized squash is a particularly nice touch - but if you're here and not ordering the pizza, you're kind of missing out. The neighbourhood is starting to wake up to their presence, with the office crowd stopping by for lunch or takeout (complete with mini cardboard pizza boxes) and locals swinging by for a late-night bite. I'm willing to bet they won't be able to eat just one pizza.